Why apply to the Ogden Honors College? To apply to the Ogden Honors College, simply check the box for Honors admission consideration on your LSU application. It only takes a second—but that one second can enrich your next four years. When you check the box for Ogden Honors, you become a member of a tight-knit community of high-achieving, engaged students living and learning together at the center of LSU’s beautiful campus. When you check the box for Ogden Honors, you gain access to our dedicated advising staff, who will help you craft and carry out a rich four-year plan for your time at LSU. When you check the box for Ogden Honors, you open the door to opportunities for scholarships, community service, study abroad, internships, and innovative research with a faculty mentor. When you check the box for Ogden Honors, you have access to some of the best classes offered at LSU, and to graduate with some of LSU’s highest distinctions. When you check the box for Ogden Honors, you put your future in motion. As an Ogden Honors student, you can choose to live in Laville Honors House, which was fully renovated in 2012, and contains some of the biggest rooms on campus. Laville also boasts a computer lab, classrooms, lounges and study spaces on every floor, and a beautiful courtyard where Honors College events are often held. Right next door to Laville is the French House, the Ogden Honors College academic and administrative building, which is on the National Register of Historic Places. 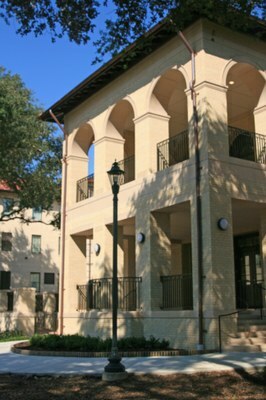 Just across the Laville courtyard is the 459 Commons, one of two dining halls on LSU's campus. This area is our Honors Campus, located at the heart of LSU, just across Highland Road from the Student Union, and a short walk to the UREC and to most academic buildings. Ogden Honors College scholarships help to support everything from academic excellence, to study abroad, to innovative projects, and to Honors Thesis research. If you are admitted to the Honors College, you will likely qualify for LSU's substantial merit-based scholarships, since our admission requirements mirror or surpass those for many of LSU's major scholarships for entering freshmen. 99% of incoming Honors students receive merit-based scholarships from the University. So what do you need to do to become an Ogden Honors student? If you are applying to LSU, you are also eligible to apply to the Honors College if you meet our recommended admission criteria. Honors College admission is very competitive. Selection for incoming first-year students is based on high school GPA, ACT or SAT scores, and the writing test of the ACT or SAT. The writing sample is weighed on an even scale with GPA and standardized exam scores, so special consideration should be given to this component of the application. The strength of courses taken in high school will be considered and is factored into the calculation of the high school GPA. If you are ready to become a member of the Ogden Honors College, you should apply for admission while applying to LSU. You may apply to LSU using the Common Application. An Honors College section is included on the application and will serve as your Ogden Honors College application; there is no separate application process. You need only select 'Yes' to request Honors College admission consideration. If you have already completed your LSU application, but did not check the box to be considered for Honors College admission, you may amend your application by contacting our office at honors@lsu.edu. The deadline to apply and be considered for the Ogden Honors College is February 1 (deadline extended). Students will be notified of their Honors College admission status beginning in November and on a rolling basis thereafter. Students are strongly encouraged to apply by the February 1 deadline. Any applications received after this date will be reviewed on a space-available basis. at least four semesters of college coursework remaining in your major. For more information on how to apply to the Honors College as a transfer or continuing student, please visit our transfer and continuing students admissions page. If you wish to appeal an admission decision, you may do so by letter, addressed to the Dean of the Ogden Honors College, Dr. Jonathan Earle. Appeals may be submitted only by the applicant and must clearly state the applicant's reasons for appealing the original admission decision. The appeal should include significant information that was not included in the original admission consideration. All appeals are reviewed on a case-by-case basis. Applicants may expect a response within 3 weeks of the date we receive the appeal. Appeals must be received by June 1.